Hyphessobrycon colimbianus common name columbian tetra. They can grow up to 5-6 cm / 2.5 inches fully grown. 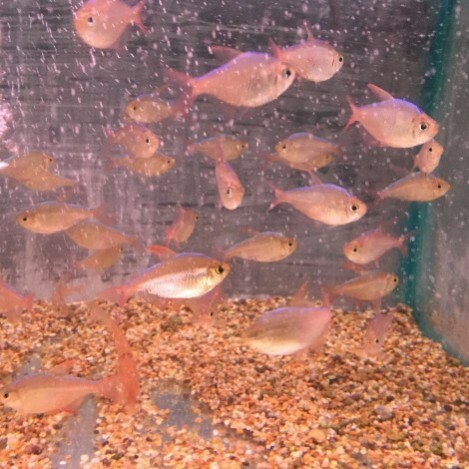 They are best kept in water parameters of PH range 6.5-7.5, and temperatures of 22- 25 Celsius / 72-77 ° F.
Columbian Tetras are a good hardy tetra. They are fine to mix on there but can be better in groups, as they are a playful tetra. They are not aggressive so can go with small community fish, but as they are very quick moving they can also be mixed with bigger fish. Columbian tetras are a greedy fish, so will usually be the first to the food. Mixing the food over the length of the tank can be a good idea, to let all your other fish eat the food to. They will eat flake, pellets, and granular foods. Also a treat of freeze dried, frozen or live food is good for them to. Columbian red fin fish are greedy fish they will eat any food you put in the tank for them. Also treated of live and frozen foods are good for them. Columbian red fin tetra only need feeding once a day at the most.